I apologise that new shade Vivacity isn’t included in the line up above because at the time I had misplaced it. I’ve since found it and taken pictures of the similar pink shades beside it for context in the swatch section below so you can see what it’s like. Starting with the simplest thing, the packaging revamp sees the old cardboard packaging ditched so that each product is presented alone and shrink wrapped as a hygiene seal. The product comes in the same frosted plastic clear tube as before but with ‘Velvet’ written in black cursive up the side and the black lid swapped for a gold one. This new packaging restyle is gorgeous, an improvement even upon the older packaging which was also plenty pretty itself. Plus, it looks like the new tube has a smaller lid and a greater quantity of product inside, although I haven’t been able to find a product weight listed anywhere for either tube to be able to compare the product quantities. The new packaging also includes a revamp of the doe’s foot application wand, pictured a couple paragraphs below. The new wand is less fluffy, so to speak, than the old wand, smaller and firmer. I much prefer it because an errant wand hair can cause problems with applying a highly pigmented liquid lipstick and this new wand doesn’t run that risk. Next, there’s the run down of the new colours. I ordered these online and couldn’t tell from product pictures whether ‘Zest’ was an orangey red or something else. I thought it might be a dupe for Lime Crime’s Suedeberry Velvetine, which is an orange toned bright red, but I ordered it anyway even knowing that shade of red won’t work for me because, hey, £3. As it turns out Zest is a bright coral, as shown above in the swatches. Vivacity is a mid pink with a slight purpley undertone, and Potent is a pure black, a great option for any ladies looking for a solidly pigmented black that won’t break your wallet. In trying the new shades is when I noticed the formula difference. The Lip Lacquers used to be very pigmented and have a slightly thicker consistency than other liquid to matte lipsticks I’ve tried. Velvetines, though I won’t use them anymore as I find Lime Crime to be an ethically ambigious company, are pigmented but very thin in consistency. LA Splash Lip Coutures are pigmented and thicker, like these MUA Lacquers, but almost seem to have more of a gel-like feeling to the formula than the more cream-like feeling I felt the Lip Lacquers had. These new shades of Lacquers have a thinner consistency, similar to LC but not quite as pigmented. The pigmentation goes on great on my inner lip, but I feel as I apply to my lip line the pigmentation seems to take a bit more building up, probably because the extra care taken means that you aren’t laying it on as thickly right away. This isn’t a problem though; applying it takes a little extra layering than the old formula did, but it doesn’t require taking as much care as the old formula did because the thick consistency on the doe’s foot wand could be difficult to control with precision on the lip line. I prefer to apply my lip line with a brush anyway when using liquid lipsticks, just to be in full control, so for me the new formula is actually great because overall it feels lighter and less dry on my lips throughout wear. It also takes re-application better, preventing that rubbery lip feeling, and it doesn’t flake as badly during eating. This new formula is now possibly my favourite of all my matte liquid lipsticks, so I plan to rebuy my favourite colours in the new packaging to make sure I get those shades in the new formula. One other thing I noticed was that the shade Reckless in the new packaging is a different shade than the Reckless I own in the old packaging. You can see in the swatch pictures above that the original Reckless was a richer, darker red, while the new Reckless is more of a bright mid red. Both are pretty and I do like the new shade, but I wish it was an additionally offered red shade of it’s own name and not a revamp of the old Reckless because that darker Reckless shade was beautiful. All that being said, please note that shades sold in the old cardboard packaging will be the old formula, and any shades in the new gold-lid packaging should be the new formula. As a formula change hasnt been announced I can’t totally guarnatee this, but I have found that to be true when I ordered these shades for myself and several to gift to American friends on my trip. If you’re ordering from the website you should be aware that I was sent Reckless, one of the first shades, in the old packaging and formula, and the new shades in the new packaging, but when I went into two local Superdrug stores they had the old shades in stock in the new packaging. If you specifically want to try the new formula and not the old then I would suggest you pick up any of the pre-existing shades–Dare, Halcyon, Tranquility, Serene, Aflush, Criminal, Funk, Kooky, Atomic, Reckless–in store in the new gold packaging, and assume that any of these listed shades ordered from the website might be old stock until the MUA website reflects a picture change for those colours. 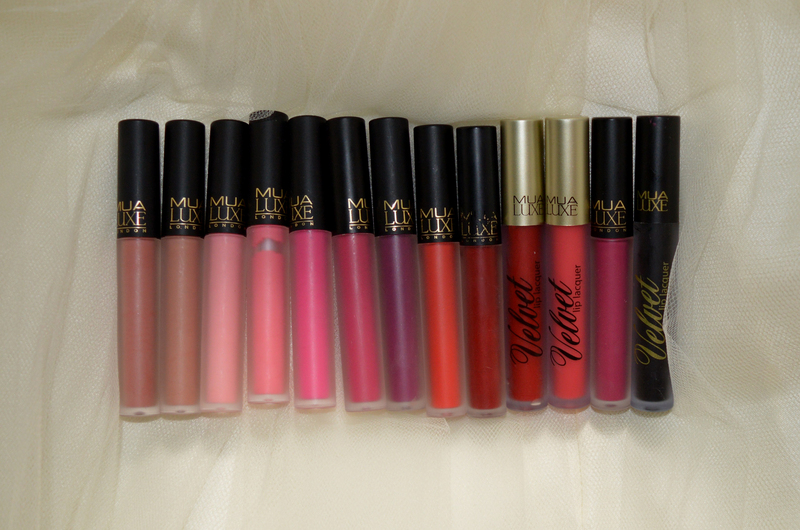 Do you wear the MUA Velvet Lip Lacquers? Will this new formula change effect your likelihood of picking up a new tube? This entry was posted in Beauty on a Budget, Hair & Beauty, Makeup Reviews, Pinup Life & Special Events, Pinup on a Budget and tagged beauty, beauty bargains, budget, liquid lipstick, luxe, makeup academy, matte lipstick, pinup makeup, pinup style, red lipstick, vintage style by missamymay. Bookmark the permalink.